Inquiry at Moscow remand center after imprisoned Makhachkala mayor attempts suicide | Russian Legal Information Agency (RAPSI). 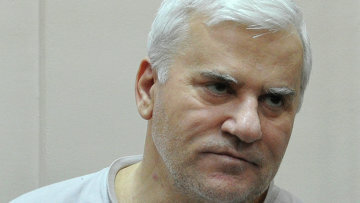 MOSCOW, June 18 (RAPSI) - An internal investigation is underway at the Lefortovo remand center in Moscow after former Makhachkala Mayor Said Amirov, who was being detained there, attempted suicide, the Federal Penitentiary Service told RIA Novosti on Tuesday. The results will be submitted to the law enforcement authorities, who will be responsible for taking the next steps. Late on June 11, Amirov cut his right forearm and ankles with a razor-blade. After receiving medical care, he was placed in the psychiatric ward of the prison hospital at the Butyrka remand center. When he was subsequently brought to court, Amirov said he did not try to commit suicide. Amirov has been the mayor of Makhachkala, the capital of the southern Russian region of Dagestan, since 1998. He was arrested on June 1 and transported to Moscow, where he was taken into custody on suspicion of having ordered the murder of investigator Arsen Gadzhibekov in the Dagestan city of Kaspiysk. Amirov has denounced the case as politically motivated. Gadzhibekov, chief of the investigation department in Makhachkala's Sovetsky District, was shot dead near his home as he was getting out of his car. He had worked on a number of crimes, including the 2010 terror attack in Kizlyar that killed 10 and injured 270. On June 4, charges were officially brought against Amirov. The investigators believe that he ordered the assassination, which was organized by Magomed Abdulgalimov, assistant city prosecutor of Kizlyar with accomplices. The authorities have arrested 11 people in connection with this case and do not rule out that more suspects may have been involved. A long-term member of the ruling United Russia party, Amirov won the title of the country's best mayor in late April, according to his administration's website. 11:55 18/06/2013 An internal investigation is underway at the Lefortovo remand center in Moscow after former Makhachkala Mayor Said Amirov, who was being detained there, attempted suicide.